You might be masquerading as a serious lawyer during the daytime, but come summer you throw off all formal pretenses and let your real self out, surprising everyone with your daredevil attitude and sense of adventure. The Action Sports Hands Free Video Camera will come in handy if you lead such an active lifestyle. This small, lightweight, shock-resistant, and waterproof video camera can be clipped to a helmet, handlebar, ski pole, snorkel, or just about anywhere else, allowing you to capture hands-free video footage while snowboarding, skateboarding, skiing, cycling, or snorkeling. 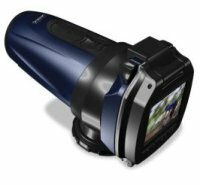 With a 53″ field-of-view for wide-angle shots, the camera takes pictures or records videos at 30 frames per second and includes 32MB of internal memory, which can store up to 1,158 VGA pictures or 11 minutes of video at 320 x 240 QQVGA or 640 x 480 VGA resolution. It has an SD card expansion slot so you can add up to 4GB of memory for 3 1/2 hours of additional video storage. Its 1 1/2″ TFT LCD allows you to preview your videos and pictures, and the camera connects directly to a television for video playback, or footage can be downloaded to a computer via USB cable (requires Mac OS 10.4 or Windows® XP/Vista). Camera mounts include a U-shaped clip and hook-and-loop fasteners to grip arms, legs, helmets, or bike frame. Includes RCA and USB cables. Camera and remote both require two AA batteries. The Action Sports Hands Free Video Camera will retail for $199.95, but you’ll need to get your own comprehensive insurance policy for all your daredevil stunts. The atc5000 is a really great camera. The screen works really well and the lens is fantastic!